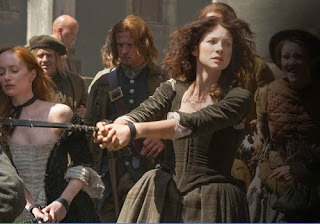 A pivotal and exceptional hour from Outlander, despite how much of the trial adhered to the tropes of innocent women charged with witchcraft and having to suffer the false testimonies of townsfolk with scores to settle, or who wilfully misinterpret events to serve their own prejudices and fears. 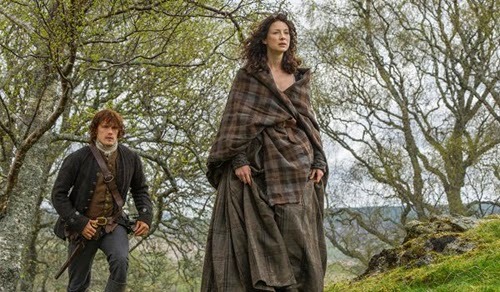 Claire (Caitriona Balfe) and Geillis (Lotte Verbeek) are taken to a nearby town thrown into an oubliette, awaiting trial the next morning—all because spurned rival Laoghrie (Nell Hudson) wants her revenge over failing to win Jamie's (Sam Heughan) heart, and laird Colum MacKenzie (Gary Lewis) apparently believes Castle Leoch would be better without them. The latter took some swallowing, as it made sense regarding Geillis (who's pregnant with his wayward brother's child), but is Claire really such a burden? She's does have a knack of getting into trouble and risking men's lives in their rescue attempts, but she's also a gifted healer the castle's in desperate need of and, well, a pleasant person to have around. Maybe the next episode will shed some light on why Colum didn't do anything to assist Ned Gowan (Bill Paterson), who took it upon himself to become the accused women's lawyer. What worked brilliantly about this episode was the fracturing of Claire and Geillis's relationship, under this considerable stress—with Claire aware that Geillis isn't a witch, but is nevertheless very spiritual and not above poisoning her own husband to pave the way to marrying Dougal and, consequently, rising up the social ladder. So while Geillis isn't evil, she's not exactly squeaky clean and perhaps does deserve to be punished. The actual trial was as entertaining and maddening as these things always are, and I enjoyed how things from Claire's recent past came back to bite her—like going to help the helpless baby a villager had left in a tree, believing it's a changeling and will be replaced by her real child, and thus being blamed for this deal with the faries going awry; or when tyrannical Father Bain (Tim McInnerny) from "No Way Out" made a surprise return, seeking payback for Claire upstaging him over the matter of a 'possessed' young boy she cured with medicine. For half its run-time, "The Devil's Mark" was shaping up to be a good but slightly rudimentary episode with some great character moments, but I was delighted by how much further it took things. This hour arguably contained some of the biggest surprised and developments of the season, plus a significant change to the makeup of the show. First, it was hard not to be moved by the sequence where Claire refused to go through with Ned Gowan's plan to plead innocence and let Geillis take the fall, and how this act of solidarity was repaid when Geillis undid her friend's efforts and chose to publicly admit she's witch and had charmed Claire into becoming her assistant—which led to her being carried away, and burned at the stake. That alone would have been a terrific moment, but I wasn't expecting the simultaneously reveal that Geillis is also a time-traveller—from 1968, hence why she shares a 'devil's mark' (smallpox vaccine scar) on her arm. Suddenly, Geillis and her free-spirited ways make more sense if she's from the late-1960s, and has therefore lived during a time that was even more progressive for women than Claire. It also opens up a lot of possibilities for the future, if time-travel isn't a unique event for Claire. Are there any others floating around 17th-century Scotland? Is it now even more likely that the strange figure from the pilot, seen staring up at Claire's hotel window, is someone who's travelled forward in time to be sure she's safe? Incidentally, I've always thought that person was Anghus (Stephen Walters). If the episode had ended there, it would have probably been a highlight of the year, but events actually continued and provided yet more significant developments. Having cleared her name, thanks to the sacrifice of a fellow time-traveller, Jamie was demanded truthful answers from his wife... and, no doubt increasingly tired by all the lies, Claire finally unburdened herself about how she came to be in Scotland, and why she knows so much about Jack Randall, the Jacobites, and the Duke of Sandringham. And while I was braced for Jamie to take this information the wrong way, I was heartened to see he was believing and open-minded. With the story now having Jamie on the same page as Claire, it should make her struggles a little easier. She has a husband who's now a confidant, and thus better equipped to protect her because he knows the full story and can help keep Claire's secret from those who'd view such a tale in a negative way. Is it plausible Jamie would buy into the story? I'm not sure, but I know it's a relief from an audience perspective. There'll be less lies, and some fun opportunities for Claire to regale Jamie about the future world—unless she's aware of the dangers about doing that. 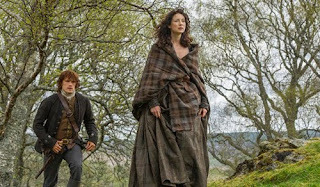 The ending was also great, as Jamie surprised Claire by delivering her back to Cragh na Dun, thus giving her the opportunity to return to 1945 and reunited with her first husband Frank. It's been he goal from the start, and a huge crossroads for the character. To stay in dangerous 17th-century Scotland and try to make a life with Jamie in his ancestral home, or return to the more civilised 20th-century and continue rebuilding a marriage interrupted by war. Claire chose, inevitably, Jamie. I was slightly disappointed this episode didn't end with Claire back in her own time, it has to be said. It would have been fun to see her try to get back to normal, making up another story to satisfy Frank and the police regarding her disappearance. She might then have actually chosen to leave Frank, to get back to Jamie—perhaps having looked him up in the history books, to discover he's going to die "soon"? Too Back to the Future: Part III? Perhaps. Regardless, having ushered big changes into the show, I'm looking forward to what the final five hours have in store. There's still a surprising amount of time left this season, considering this hour could easily have acted as a finale.